The TENTacle project has arranged a number of stakeholder seminars with a broad representation of public and market players. The purpose of these seminars has been to review the interim findings and steer the work towards policy and action recommendations on how to capitalise on the TEN-T core network corridors (CNC) for prosperity, sustainable growth and territorial cohesion. At the final stakeholder seminar last week (20–21 November 2018) in Gävle, the project partnership and the interested stakeholders discussed how results of Interreg projects have been and could be used in the future. After some welcoming words by project manager Wiktor Szydarowski from Region Blekinge, George Panagakos (Technical University of Denmark) presented his research on past bottom-up corridor projects in the BSR (Task 5.1). He summarized best practise cases in committing stakeholders to corridor implementation in eight lessons addressed to different responsible actors. The seminar also featured reports from the completed TENTacle pilot cases Westpomerania-Skane (Task 2.2), Vidzeme (Task 3.2) and the macroregional showcase “TENTacle and the Eastern Partnership” (Task 5.4) on the takeover processes for their outcomes. Since the project activities and outcomes in the three presented tasks differ, the adoption of their results will also vary. While the activities of the regions Westpomerania and Skane will be implemented by a European Grouping of Territorial Cooperation founded for this purpose, Vidzeme Planning Region will take over the responsibilities of executing the regional mobility investment plan itself. The East-West Transport Corridor Associationas will function as a facilitation platform for the results of TENTacle task 5.4 in realizing the ambition to strengthen the corridor interoperability and intercontinental supply chains between the CNCs and the EU partnership countries. Representatives from three macroregional intergovernmental networks VASAB Secretariat, the Conference of Peripheral Maritime Regions (CPMR) Baltic Sea Commission and the Baltic Sea States Subregional Cooperation (BSSSC) also participated in the seminar. Asa Bjering, executive secretary at the CPMR Baltic Sea Commission, Liene Stikane, spatial planning expert at the VASAB Secretariat and Jon Halvard Eide, spokesperson for the BSSSC, shared their expectations to the final report by TENTacle and discussed how to lobby for the planned policy and action recommendations. 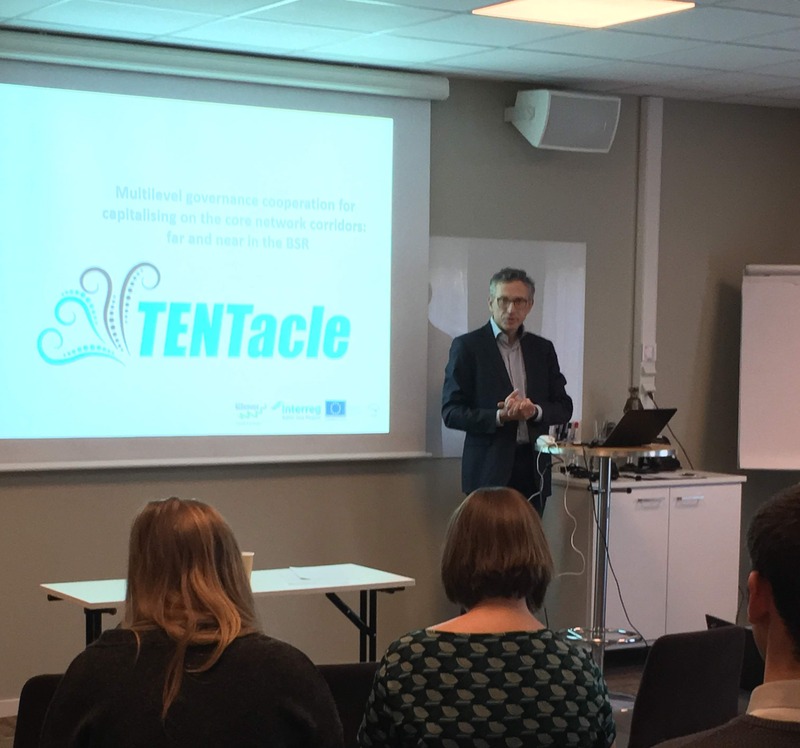 The feedback from the stakeholders gathered, and especially from the present pan-Baltic organisations, will help the TENTacle project prepare its final report on policy and action recommendations (due in March 2019). The final report will be based on the preliminary conclusions from all pilot cases. All outputs and reports can be found in the download section of the TENTacle website.